An adult-oriented bishoujo adventure game. 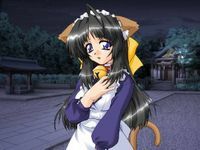 The Cat God gives me a Nekomimi cat girl in my dream... Days later, I find a cat girl sleeping in a box, right in front of my door! I came here to serve you, she says. Later on, more intriguing pets join us as well. My apartment is filled to the brim with sweet girls, and my life really turns around! By the way, just who is that almighty cat?